COVENTRY, UK, February 23, 2015 (ENS) – The first autonomous vehicle designed to run on UK public roads was officially unveiled at a government launch event in Greenwich earlier this month. Road tests are set to begin this spring. 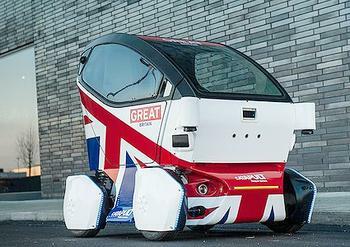 The LUTZ, for Low-carbon Urban Transport Zone, Pathfinder pod is part of the UK Government’s Transport Systems Catapult Autodrive project, a £20 million (US$30.8 million) project. The LUTZ Pathfinder pod is a two-seat electric car with space for luggage. It has a top speed of 15 mph (24 km/h) and a range of 40 miles (64 km) or can run for eight hours. The self-driving equipment includes 19 sensors, cameras, radar and Lidar. Users can hail them by using a smartphone app. A prototype of the LUTZ Pathfinder pod was presented to the media at the February 11 event, which was attended by Business Secretary Vince Cable and Transport Minister Claire Perry. “The projects we are now funding in Greenwich, Bristol, Milton Keynes and Coventry will help to ensure we are world-leaders in this field and able to benefit from what is expected to be a £900 billion industry by 2025,” said Cable. The LUTZ Pathfinder pod is being developed by the UK Automotive Council, Department for Business, Innovation and Skills, RDM Group and the University of Oxford Mobile Robotics Group. The LUTZ pods are being built by the Coventry-based advanced engineering company RDM Group. RDM will manufacture the pods at its new £400,000 advanced engineering centre in Coventry. They will be equipped with sensor and navigation technology provided by the University of Oxford’s Mobile Robotics Group. Three of the LUTZ Pathfinder pods will be tested in the town of Milton Keynes later this year to ensure that they can comply with the Highway Code. If the tests are successful, a fleet of 40 pods will be rolled out for further testing. The Transport Systems Catapult, the UK’s technology and innovation center for “intelligent mobility,” played a major part in securing the investment in driverless technology in December 2014, culminating in a £40 million testing program jointly funded by the UK government and private industry. This push toward autonomous cars began when the “Introducing driverless cars to UK roads” competition was launched in July by the UK’s innovation agency, Innovate UK. The Innovate UK competition was originally due to receive a total of £10 million in funding. But in December’s Autumn Statement, Chancellor of the Exchequer George Osborne announced that the government was injecting an additional £9 million into the competition. Combined with the private investments being made by the project partners in the three successful consortia, the UK is now set to invest around £40 million in developing this new field of technology. “The Transport Systems Catapult was created to champion intelligent mobility and to drive major investment in new technologies that can position the UK as global leaders in this field,” Transport Systems Catapult CEO Steve Yianni said, following the December announcement. Led by design and engineering consultants Arup, the UK Autodrive program will see research teams test public reaction to autonomous vehicles around Milton Keynes and Coventry, carry out real-world testing on public roads and footpaths, and develop new legal and insurance protocols to make driverless mobility safe and viable. Yianni added that the Catapult would also be keen to provide support and know-how to the other two consortia, who will be trialling vehicles in Greenwich and Bristol. UK Autodrive will deliver a program of feasibility studies and practical demonstrations in Milton Keynes and Coventry, where the city councils are taking the lead in developing the urban infrastructure technologies required to support driverless mobility. The feasibility studies will consider the challenges of introducing self-driving vehicles from a technical, social and economic perspective. The studies will provide insights for vehicle manufacturers, cities, commercial operators, legislators and insurers to develop the legal framework for the roll-out of autonomous mobility. The partners in the UK Autodrive consortium are Arup, Milton Keynes Council, Coventry Council, Jaguar Land Rover, Ford Motor Company, Tata Motors European Technical Centre, RDM Group, MIRA, Thales (UK), Oxbotica, AXA, the international law firm Wragge Lawrence Graham & Co, the Transport Systems Catapult, the University of Oxford, University of Cambridge, and the Open University.